This very rare teacup and dish are from the Qing Dynasty, Yongzheng (1722-35) period, c. 1733. The set is decorated with a sequence of pictures from the Canton city walls down the Pearl River, all the way down to Whampoa where the European ships are anchored waiting for cargo. It is painted from an elderly Chinese point of view, so lovingly and charming it is breathtaking. All features are from reality and it is my conviction there are names and reasons for everything. The panorama begins at the river just below the tributary to the left where the westerners Hongs and the tea warehouses of the Chinese merchants were located, just slightly out of view about where the fisherman stands. At the time of this view the Hongs as we have got to know them are not yet built. 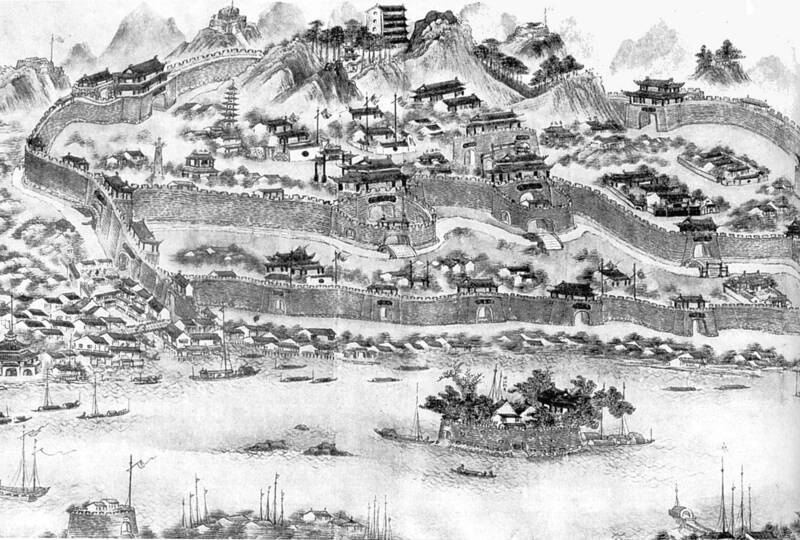 Winding along the water front beginning with a larger portal is the city walls of Canton. Outside it are warehouses and storage facilities along the river. 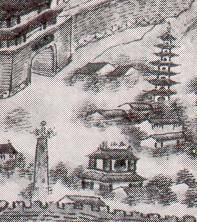 Inside the city walls we can see the "Mohammedan tower" and the "Flowery pagoda". On the hill is the Five storey watchtower. These three landmarks often appears in paintings and watercolors of Canton and in rare instances, on export porcelain like this. Outside the city walls, to the right of the watchtower there is a flag waving. Looking at the Drottningholm drawing, this flag seems to belong to a small fortress at a hill top. To the right of this, visibly on the cup but not on the picture, is the smaller "French Folly" fortress. The next customs house upriver from Canton, is visibly at the bottom left of the picture. The rounded fortress are probably - due to its suggested lush vegetation - the "Dutch Folly Fort". A well known land mark and often seen in the views of Canton. It was located immediately outside slightly downstream, of the Western Hongs. At the bottom pictures we can see the masts of the western ships laying at anchor at the Whampoa anchorage. Most ships had the upper parts of their masts as well as most of their rigs taken down during the stay however that they should be visilble from Canton is an artistic liberty. They were close, but not that close. In the middle, is the famous nine storey pagoda of the village of Whampoa. The houses to the right of the pagoda partly hidden by the vegetation is probably the banks halls erected by the westerners as storage halls during their six months stay, while buying and loading the cargo and waiting for the trade winds to turn for their homeward bound voyage. The porcelain is of an early 18th century eggshell type. The encre de chine, sepia or grisaille (all referring to the same decorative style) and its golden border can be dated to the first half of the 18th century on stylistic grounds. When comparing to other porcelain pieces, the most similar dateable porcelain is the Lee quartering Astely plate illustrated in D.S. Howard, Chinese Armorial Porcelain, as J6, London 1974, page 329 and dated by him there to 1735. The same plate is then illustrated in Howard and Ayers, Masterpieces of Chinese Export Porcelain, London 1980, on p. 44-45 and there dated to c 1733, since the porcelain could have been ordered by Eldred Lancelot Lee of Coton, who died in 1734. In both cases the suggested date is 1735 or earlier. The rim is decorated with alternating panels of views of London and a river view of Canton featuring pretty much the same view. An interesting source for all these decorations is a picture from an album with Chinese paintings from the time before 1748, kept at the Chinese Pavillion at the castle of Drottningholm in Stockholm. There are several paintings in an album with views of Canton and the Pearl River. In my view they could have been made on the order of the Kangxi emperor, since he had a great interest in the trades and the arts of his empire and made extensive visits in the South of Chinese. One sign of a late 17th century date is the fact that the Hongs does not seems to exist yet and that the western Ships who are depicted on another picture in this album, have an older type of rig, with a "blind" mast at the fore, then the "modern" frigates that came into use in the early 18th century. Here is the Views of Canton picture from the album kept at the Chinese Pavillion at the Castle of Drottningholm in Stockholm. The pictures are all painted in black ink, which gives a new and interesting explanation to the black ink style in export porcelain.